The Bloodmoon esp power "War Hounds" for the Warrior sign does not work. The power does nothing when cast and the effects are listed in game as "sEffectSummonCreature01" instead of "Call Wolf." You ever think of just making the lord sign perma regeneration like an actual trollkin? 1 Per sec, someone else had got it up on this site, but it be good to change yours so its all inclusive. please tell me what mod did you use that had perm health regen? Fantastic mod that works great in conjunction with RAMF for a refreshing character creation experience, 5/5! 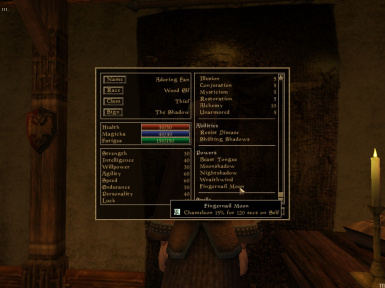 Love the mod, except it appears that the ability "Hidden Pockets" from the Thief sign doesn't have any effect! It shows up in Active Effects but it doesn't seem to work!? Anyone else experience this problem? Anyway, I would rate this mod 4/5. Thanks! FMM 1.5x INT, not 15 pts. I could be wrong about this, but I think the FMM is potentially greater in the original sign--could be as much as 25 pts, for an Altmer--than you allow in the new Apprentice sign. Which is your choice, of course, but it makes your Apprentice sign a bit less attractive. Otherwise, I think this is a thoughtful and more interesting series of birthsigns than are provided in the native game. And the documentation is extremely clear. When I wrote the readme, I put things in terms of how the CS handles it. Only whole integers can be entered as values in the Spell effects creator. Therefore, with regards to Fortify Maximum Magicka, the game automatically take into account that the number you entered gets multiplied by 10^(-1) - that is, it gets a decimal point plopped before the last digit. The UESP puts it more eloquently: link. As you can see toward the bottom of the article, to achieve the 1.5 multiplier, the value entered into the CS is 15 points. This is the 'lingo' I used when I typed up the readme. Too Long; Didn't Read: don't worry, it's correct. You can thank LHammonds once again. This was THE most complete, clear, explanatory description I have seen on TesNexus. At this moment (yes, I checked) I have already downloaded 625 plug-ins from this site and I did read the descriptions from all of them. Your description of the file simply blew me away. I admit that your file isn't quite of the magnitude of "Telvannis", from the Tamriel Rebuilt team, however the sheer detail and accuracy of your description can make the professional copyrighters blush. Hmm, isn't bamf the sound effect when Nightcrawler teleports? Yup, that's the sound he makes. I'm not an avid Marvel Comics reader, but I think X-Men are pretty cool. Hmm, isn't "bamf" the sound effect when Nightcrawler teleports?